Great Britain: 1913 Sea Horse master die proof in sepia. bl.uk > Online Gallery Home	> Online exhibitions	> Philatelic rarities	> Great Britain: 1913 Sea Horse master die proof in sepia. The attractive high value stamps, 2/6, 5/-, 10/- and £1 of the Sea Horses design, were first issued in 1913. 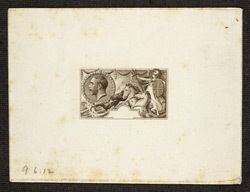 The engraver prepared a die which had a single image upon it. This die was then used to prepare the printing plate, which had eighty images upon it. As the engraver proceeded with his work on the die, he took proofs to check his progress. A progressive proof of the master die in sepia is shown here.